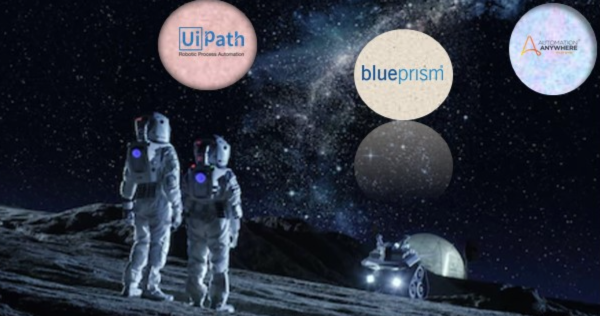 It’s not been possible to escape the wild world of RPA valuations these past few months, culminating in the recent claim from UiPath and its investors that the firm is worth $3 billion, despite the reality that AA’s annual revenues this past year are ~$100m, Blue Prism’s ~$55m and UiPath’s ~$65m (HFS estimates). 1. RPA directly replaces people. This is incorrect, its all about augmenting processes and the improving the quality of the workforce, not eliminating actual employees with bots. As our recent State of Operations Study with KPMG, across 381 Global 2000 operations leaders, illustrates, only 7% go into automation expecting direct FTE reduction. Consequently, the C-Suites from 70% of these organizations are happy with the ability of RPA to reduce reliance on labor. Hence RPA augments labor, it doesn’t replace it. 2. RPA can scale rapidly to have a dramatic impact on enterprises in months. Incorrect. 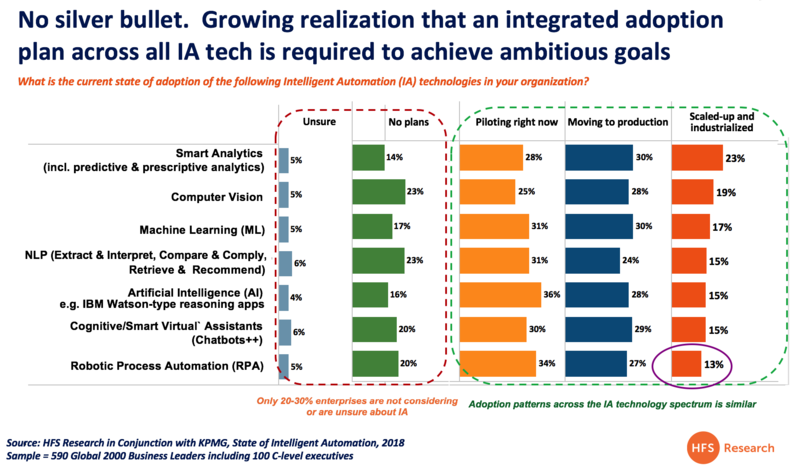 The vast majority of these initiatives are project-based, not scaled – only 13% of RPA adopters are currently scaled up and industrialized, according to new data from 590 enterprises worldwide. Most RPA adopters are still tinkering with projects and not rushing towards enterprise scale adoption. 3. RPA tools can achieve amazing benefits all by their lonesome. Incorrect. RPA has to be driven by a motivated business line, and supported by capable IT. This isn’t the typical software sales model where licenses are sold en masse and distributed willy-nilly across the business. Without a genuine buy-in and partnership between business units and IT, RPA fails. There has to be a balance. 4. RPA delivers intelligence. Incorrect. RPA is a gateway drug to digitize low-value processes and free up human-time to focus on higher value activities. RPA is a catalyst to drive a more intelligent enterprise operations but is not intelligent itself. 5. RPA will be a unique game-changing product in the market for years to come. Incorrect. Most organizations take a couple of years to learn and understand how to incorporate the benefits of RPA, but after that it’s merely a tool in the enterprise toolbox. 6. We will still be talking about “Robotic Process Automation” in two years time. Very unlikely. The narrative is already shifting to a broader Intelligent Automation roadmap. RPA is very good at breathing new life into legacy processes and technologies but isn’t driving genuine digital business model transformation. RPA helps digitize the underbelly that supports the ultimate digital business outcomes by digitizing manual processes and fixes system integration points. It is a gateway to achieving front to back office workflows that are critical for digital business to service the needs of their customers in real-time. However. once RPA has performed these tasks, the real challenge for enterprises in going beyond simple RPA to drive real intelligence into the processes. Hence, RPA is a gateway to creating basic digital infrastructure across the organization, but other AI tools are needed in the future to help organizations anticipate their customer actions before they happen. Once the digital baseline is created, enterprises need to create more intelligent bots to perform more sophisticated tasks than repetitive data and process loops. This means having unattended and attended interactions with data sources both inside and outside of the enterprise. 7. Valuations of $2/3 billion per firm are realistic. Incorrect. While software vendors such as Mulesoft and Marketo have recently fetched insane multiples of $5bn-$6bn, these are very established IT applications that augment multi-billion dollar industries. RPA tools are supporting backend automations that require a very unique combination of business/IT aligned delivery, as opposed to being front-end apps that can be sold to IT budgets en masse. RPA is a BandAid, not your new enterprise platform. These are not the typical products an SAP or Oracle can easy ingest into their apps portfolios – the needs are too process heavy, too consultant dependent to fit their sales models. RPA has dramatically altered the narrative among middle/back office process owners. We predict a market approaching $2 billion this year alone and growing fast as traditional process outsourcing models are hugely impacted. We’ve even gone as far as declaring RPA the “new outsourcing”. 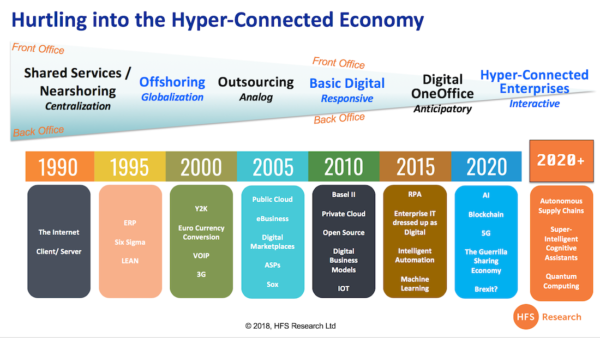 RPA has been a major game changer in the world of operations and outsourcing…. but $3 billion valuations of software firms barely hitting $50m in revenues? We don’t think so… let’s learn to keep nurturing this great business and not squeeze it until it breaks. While the industry is busily adding fancy new words to their résumés and job titles, we have to remember that our technological journey is gradual. Change comes slowly and incrementally and you can’t just rip off the proverbial Band-Aid, hire a bunch of Millennials and Gen-Z kids… and it’s mission accomplished. As the Hyper-Connected journey illustrates, it took 30 years to get where we are today – and that’s because both front and back offices needed to go through major, secular changes to become efficient and digitized. But the next phase is not a trade-secret – this “Future of Work” is merely a phased transformation of the present. Dumb robots evolving into intelligent assistants… ineffective supply chains plagued with manual breakpoints becoming fluid, autonomous and intelligent – with the ability to interact with other supply chains. Quantum computing and blockchain emerging to challenge the very logic of TCP/IP and computing architectures. But to get there, we need to be experimenting, tinkering, exploring and disrupting with the kit that available today to get our organizations in a place where all these far-flung innovations can have some real possibilities. So let’s have less talk about the future of work and focus on the present… we know where we are and what we need to do. So let’s do it!